Aristotle was a Greek polymath, what that means is that he studied and was an expert in many things. Some of these included physics, biology, zoology, metaphysics, logic, ethics, aesthetics, poetry, theater, music, rhetoric, linguistics, politics and government, just to name a few. He was a student of Plato for 19 years and then went on to tutor Alexander the Great. 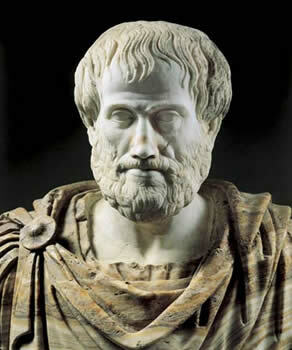 Aristotle believed that all peoples' concepts and all of their knowledge was ultimately based on perception. It is also how his own knowledge and expertise developed; by observing and perceiving things that others didn’t. Some of Aristotle’s theories were not confirmed or refuted until the 19th century, despite the fact that he formulated them 384 BC (his birth) and 322 BC (his death). Aristotle is today considered to be the earliest natural historian. His theories are still studied today. Sometime during his life, Aristotle travelled to the island of Lesbos, which was and still is teeming with wildlife. Aristotle was so taken with the island and its creatures that he did research on the natural history of the island, as well as its surrounding seas and other areas. While there, Aristotle made many observations and interpretations, some of which are recorded in his texts: History of Animals, Generation of Animals, and Parts of Animals. These observations were quite detailed and many striking passages on sea-life were based on the wildlife that was assessable to him as well as from the fish that fisherman hauled in. However, some observations are mistaken and tainted with myths and superstition. Nevertheless, in pursuit of knowledge Aristotle dissected many animals, but no humans to base his observations on. He has very detailed observations on catfish, electric fish and angler-fish, as well as on cephalopods, such as Octopus, Sepia (cuttlefish) and the paper nautilus (Argonauta argo). His observations of the hectocotyl arm, which is used in sexual reproduction by cephalopods was widely disbelieved until it was rediscovered in the 19th century, some 2200 after Aristotle’s discovery. Aristotle also knew enough to separate aquatic mammals from fish. He even classified sharks and rays into a separate group. During his study, Aristotle distinguished about 500 species of birds, mammals and fishes. Some of the characteristics of the manner of his classification were still used until the 19th century. He knew enough to separate vertebrates and invertebrates, as well as classify mammals separately from birds and fish. Aristotle also noted that creatures have facilities that were required for their survival, such as four-stomachs and weak teeth in ruminants. However, he credited this to intellectual design (God) as opposed to evolution. It is believed that only one third or about 30% of the works of Aristotle survived. The rest were lost to history. However, just 30% of his works are enough to credit him as the father of biology, as well as a leading figure in the fields of ethics, logic, and metaphysics.